Located on 230 acres of the most fertile and historic land in the Bluegrass, Blackburn Farm's goal is to remain small and select. This is where Boston sired Lexington, where American Eclipse stood at stud, and where numerous stakes winners have been born and raised. By developing personal relationships with each of our clients, we help them attain their goal of raising good horses. The success of our philosophy is evidenced by results – both at the sales ring and in the winner's circle.I look forward to talking with you about your goals, and showing you the facilities here at Blackburn Farm. On behalf of our staff, I welcome the opportunity to help you with broodmare management, sales representation and bloodstock advice. Kentucky's horse racing heritage goes back centuries, but the state's foundation of Thoroughbred success began ages before. Thanks to the abundance of native limestone, the Bluegrass is one the best places in the world to raise Thoroughbreds, and within this region, perhaps no finer land exists than Blackburn Farm. Near the end of the Revolutionary War, Virginian George Blackburn moved his family to Kentucky. They settled on several hundred acres of lush and gently rolling grasslands, situated in what would become northern Woodford County. Blackburn named his new home Equira Farm. The Thoroughbreds the Blackburn family raised over the next two centuries became legends of the American turf. Boston, commonly considered the finest racehorse of the 19th century, stood as a stallion at Equira and sired Lexington. A great racehorse in his own right, Lexington would go on to become arguably the most successful stallion in history. Throughout the years, other great Thoroughbreds – American Eclipse, Blackburn's Whip, Grey Eagle, Grey Medoc and Buzzard Superior – graced Equira's lush pastures and left their influential mark on the breed and racing history. In 1990, the Barnett family purchased the land that had been home to Equira Farm. They named their new venture Blackburn Farm as a lasting tribute to the family that had exercised stewardship for so long over one of Kentucky's most important Thoroughbred operations. And since that time, the Blackburn tradition of excellence has continued. In the last 15 years, such noble horses as Lion Heart-G1, Harmony Lodge-G1, Graeme Hall-G2, Nonsuch Bay-G1, Indy Five Hundred-G1, Miss Matched-G3, Crab Grass and Win Crafty Lady have all called Blackburn Farm home. Recently, modern science has affirmed George Blackburn's decision of 200 years ago in choosing his homestead. Noted agricultural appraiser Roger Allman of The Farm Clinic completed a study of Blackburn Farm and concluded that the quality of its land is among the top farms in The Bluegrass. Blackburn's philosophy is simple: we emphasize communications as a tool for building solid, long-lasting relationships. call – he's fully accountable to his horses and to his clients. Blackburn Farm believes that clients deserve to know about important developments in the lives of their horses. Phone calls are returned promptly, questions are answered thoroughly and honestly, and visitors are always welcome. We want our clients to feel confident that they made the right choice in entrusting their horses' care to Blackburn Farm. Blackburn Farm uses only carefully selected professionals to provide expert veterinary, blacksmith and nutritional care. Dr. William A. Fishback has been in charge of our reproductive veterinary work for more than a decade. A senior partner with Hagyard, Davidson, McGee, Dr. Fishback’s experience, expertise and dedication make him an invaluable asset during the long hours of the breeding season. Blacksmith Victor Zambrano plays a vital role in helping us raise horses that go on to become sound, durable runners. Victor visits every three weeks to make sure that the foals, weanlings and yearlings are always well trimmed to promote proper development. We work closely with Hallway Feeds, individually monitoring growth patterns, and ensuring that all horses receive the proper nutrition necessary for optimum health. All horses receive a balanced diet of natural grazing, hay and Hallway Feeds formula providing protein, essential amino acids, vitamins, macro minerals, trace minerals, bacteria and enzymes. 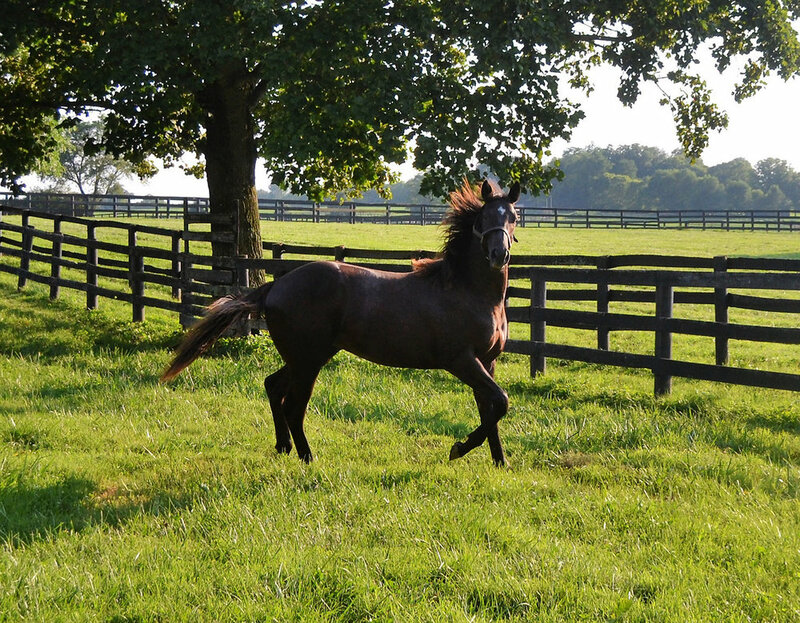 Blackburn Farm is a full-service mare care facility and welcomes the opportunity to help you build a breeding program or enhance the one you already have. Stallion selection is one of the most important decisions a mare owner will make each year. Whether you're breeding for the sales or to race, we can help you maximize the potential of your mare to produce foals of which you'll be proud. No stallions stand at Blackburn Farm. Therefore, we have no bias toward any particular bloodlines or any agenda we want to promote, leaving us free to assist you in every price range. Blackburn Farm is conveniently located near many of the premier stallion stations, including Airdrie, Ashford Stud, Hurstland, Nuckols, Brookdale, Wayfare, Pin Oak, Wintergreen, Stonewall, Darby Dan, Buck Pond, Hopewell, Lane's End, Three Chimneys, WinStar and others. Our experienced personnel will ensure your mare's trip to the breeding shed is pleasant and stress-free. Blackburn Farm acts as agent for clients at the Keeneland and Fasig-Tipton auctions in Lexington, Kentucky and Saratoga, New York. With years of experience, honed by watching hundreds of horses grow and develop, we're ready to evaluate a horse's potential and advise you at which sale its value can be best maximized. Sales preparation begins at Blackburn's 230-acre facility with careful attention to grooming, diet and exercise. By focusing on a small, select group of horses, we are able to closely evaluate each horse's condition daily. Constant monitoring of the yearlings' progress ensures that each horse is optimally prepared when the time comes for it to be presented to buyers at the farm and at the sales ring. In addition, Blackburn Farm can act as consignor for horses that you prepare. Your horses will then be groomed and shown by accomplished professionals who understand the importance of presenting your horse to its best advantage. Prospective buyers are encouraged by Blackburn Farm's impressive list of horses sold at auction, including Win Crafty Lady's session-topping colt by Unbridled's Song, which sold at Saratoga for $1.85 million in 2001 and Win's Fair Lady who sold for $2.2 million in 2005. And our reputation throughout the Thoroughbred industry has been proven by the confidence buyers have shown when bidding on horses offered by Blackburn Farm. The first piece of advice I give people entering the horse business is: find an advisor you can trust. Someone who will commit time and effort in helping you understand both the horses and the people in a transaction. Make no mistake: the horse business is ultimately a people business. Horses are unpredictable; that's an absolute certainty. In fact, it's perhaps the greatest allure and greatest pitfall of the Thoroughbred industry. And, while anyone who plans to breed or race horses has to learn to accept the joy and frustration with equal aplomb, one aspect of the business should be free of unpredictability; the trust you have for the people giving you bloodstock advice. Maybe you're considering your first investment in the Thoroughbred industry. Or you're wondering if your breeding stable is on the right track. Perhaps you've had success with a filly on the racetrack and are thinking about retiring her to the breeding shed. We would be happy to discuss strategies for achieving your goals. Over the last three decades, Mike Barnett has been professionally involved in all facets of the Thoroughbred industry. He worked for seven years on the racetrack and five years as Sales Manager of Fasig-Tipton's Louisiana Division. For the last 18 years he has managed his own breeding farm. Mike has a comprehensive knowledge of horse racing, breeding and the bloodstock market. More importantly, he understands the relationships between each area of the industry. His expertise and experience will put the odds in your favor when you buy and sell Thoroughbreds.